Scallop chowder makes a nice alternative to the ubiquitous clam chowder. In fact, you could use almost any type of seafood in a chowder. My favorite soup book of all time, aptly called The Soup Book by Louis P. DeGouy, was originally published in 1939 and has an awesome chowder chapter with recipes that include blackfish, carp, catfish, eel, flounder, frog legs, halibut, smelt, snapper, sturgeon, turtle, and of course, scallops. 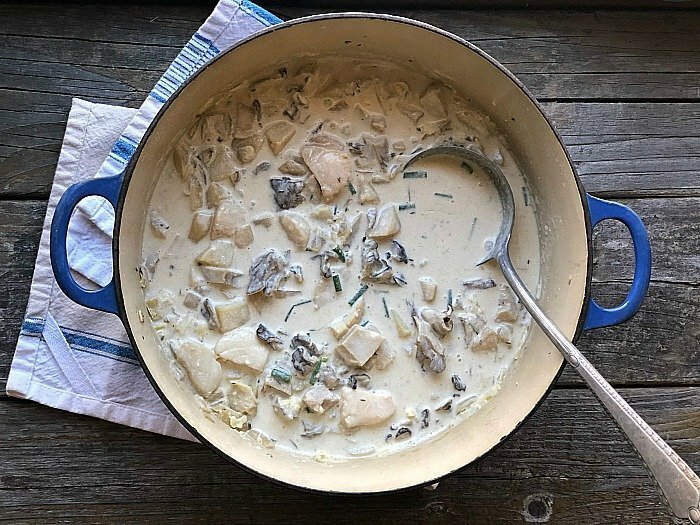 If you’ve never made a chowder with anything other than clams, scallop chowder is a good choice. Unlike other types of shellfish there’s no shucking, de-shelling, steaming or boiling that needs to be done first. You can use either sea scallops or the smaller and sweeter bay scallops. My recipe was inspired indirectly by another great soup book, 50 Chowders by Jasper White. He has a recipe for a scallop chowder with cabbage and bacon. I took that as a challenge to come up with my own unique recipe! 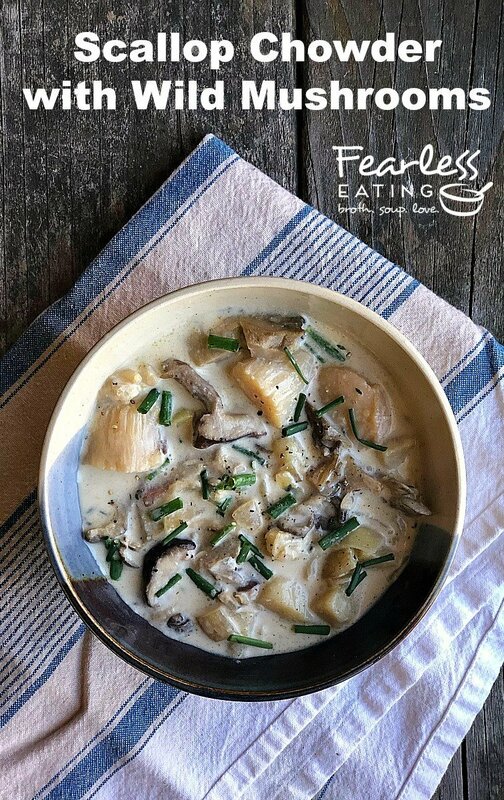 I thought for sure mushrooms would make a great scallop chowder. I went to the store, picked up some cremini mushrooms and made the chowder. It was good. Well I can’t accept anything other than GREAT when it comes to chowder. I take it personally when my homemade chowders aren’t totally epic. No really. I actually get disappointed in myself because I no longer expect to get great chowder anywhere other than my own kitchen. I rarely order chowder in restaurants anymore. It’s all so average and I get really annoyed when I have to pay for good-but-not-great chowder, which is 95% of the time. It was then that I remembered I had a nice bounty of frozen wild maitake mushrooms (also called “hen of the woods”) that I’d foraged this past year. I re-made the chowder the next day and WOW, WHAT A DIFFERENCE! The mushroom flavor was so much more pronounced. It complemented the scallops beautifully and adding some chives at the end was the perfect garnish. Of course, you might not have your own foraged wild mushrooms hanging around in your freezer. In that case, many edible wild mushrooms are harvested by enthusiastic foragers and sold at farmers markets and other types of specialty markets. Some of the more common types of wild mushrooms you might come across include maitake, black trumpets, chanterelles and chicken of the woods, at least here in the northeast United States. You can try any type of wild mushroom in this recipe or use combinations of them. If there are few options for wild mushrooms where you live (or it’s just not wild mushroom season), there’s a simple solution. Use shiitake mushrooms. 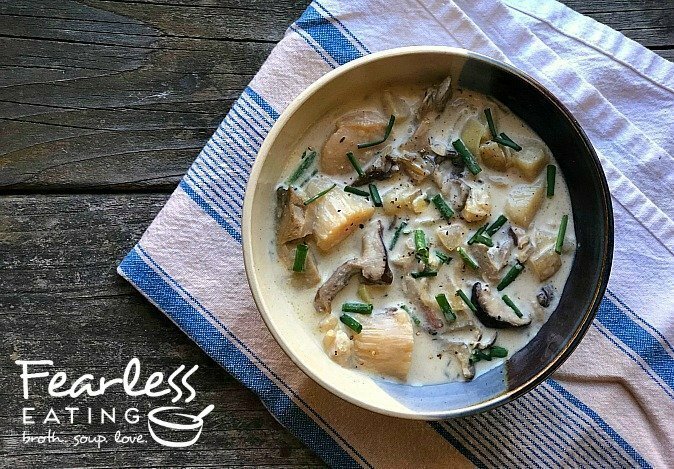 They have a rich, bold flavor that works really well in chowders and their meaty texture is actually similar to scallops! Though they only grow wild in Asia, shiitakes are now commercially cultivated all around the world, including here in North America. They are now widely available in all types of markets, including supermarkets. Whatever mushrooms you choose, try to avoid the common button mushrooms which pale in taste to wild mushrooms. That includes cremini mushrooms which are a button mushroom at a slightly more mature stage. All this said, my final recipe still wasn’t done. Clam Broth or Fish Stock? I had some friends over for a tasting party the day after I made the recipe with the wild mushrooms. I’m working on recipes for a New England seafood cookbook and this is one of the recipes I’m considering. 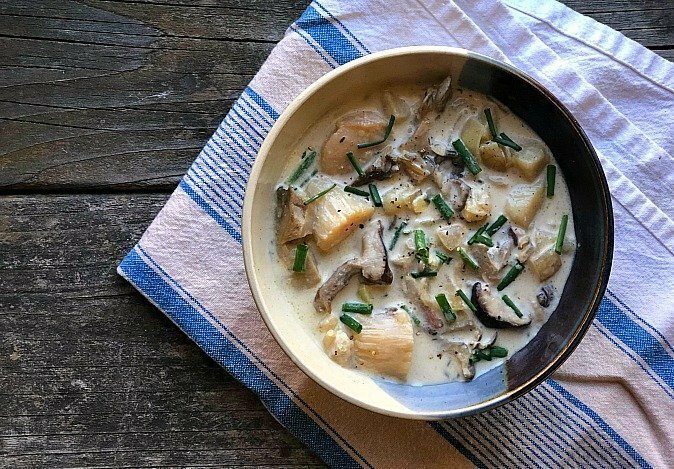 Several folks commented that they thought it could use a little more seafood flavor, that it tasted a little more like a mushroom chowder than a scallop chowder. I realized they were right. So the next day I re-made it again. This time I used clam broth as the base instead of fish stock and that elevated the briny flavor to have more of a fresh ocean taste. 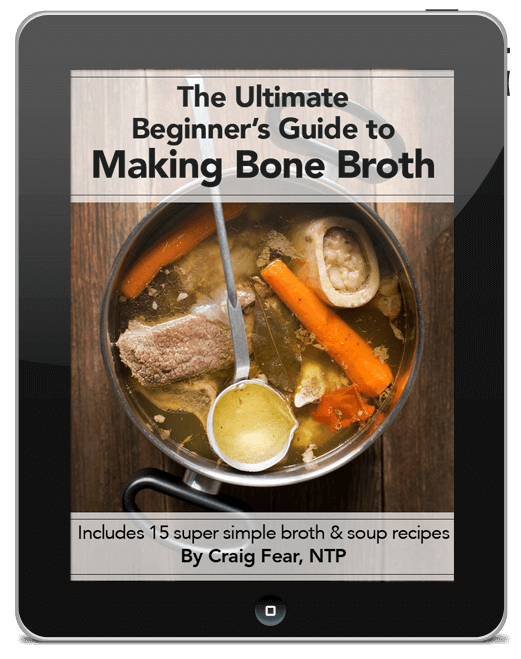 Now you could certainly use fish stock or even chicken stock as well. But clam broth is the best choice. 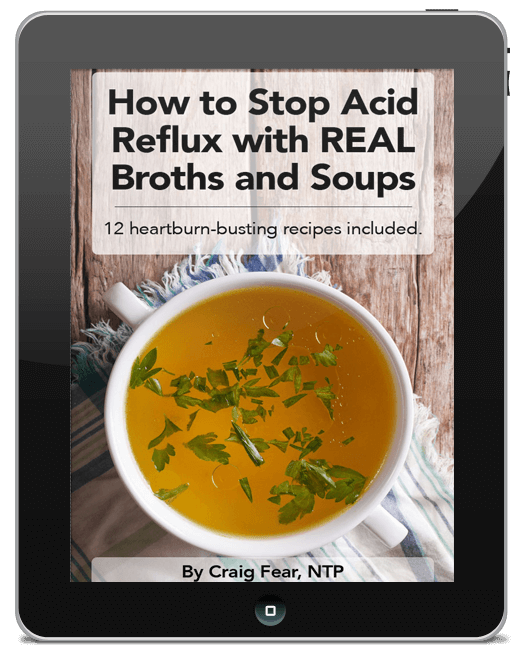 Ideally, for the best flavor, you want to make your own clam broth from freshly steamed clams but since we’re not making clam chowder, you’ll probably need to purchase some bottled clam broth instead. Not to worry, bottled clam broth (also called “clam juice”) can be pretty dang good. 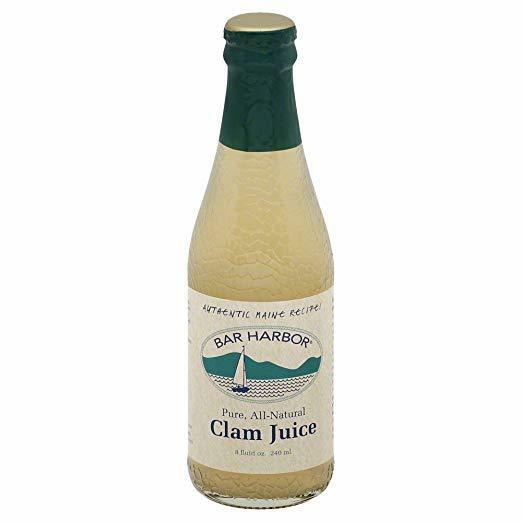 I’ve tried a few different brands and as of right now, my personal favorite is Bar Harbor clam juice. Finally, let me explain one more thing about my scallop chowder recipe. To Add Flour or Not to Add Flour? That is the great chowder question which is endlessly debated among chowderheads from Maine down to Connecticut. My feeling on it is that it depends on the recipe. Sometimes I’m anti-flour and sometimes I’m not. In this case, adding just a little flour gave it a slightly thickened texture that didn’t in any way interfere with the flavor. Nor did it make the chowder too pasty which is a common issue with restaurant chowders, especially chain restaurants. At my tasting party I made a portion with flour and without flour. The recipe with flour was the overwhelming favorite. That doesn’t mean you have to use flour. If you’re gluten-free, skip it. And of course, if you’re on the anti-flour side of the debate (which means you probably live in Maine), you’re probably shaking your head in disgust at the thought of it anyway. A flour-free version still tastes delicious! A scallop chowder is a great alternative to the ubiquitous clam chowder. Wild mushrooms complement scallops really well in both texture and flavor. Chives add the perfect finishing touch. In a heavy bottom stock pot, render fat from bacon over very low heat for about 5-7 minutes. When a few TBSPs renders out, raise heat to medium and brown the bacon slightly. Remove the bacon but leave the rendered fat in the pot. Reserve bacon and chop into bacon bits. If you don't get enough fat to render out, add 1-2 TBSPs butter to the bacon fat. Add onion, mushrooms, garlic, thyme and bay leaf and saute for 7 to 10 minutes until cooked through. Add 1-2 more TBSPs of butter, if necessary. Add stock and potatoes and bring to a gentle boil. Simmer, covered for about 10-15 minutes or until potatoes are tender. Turn of the heat and add the scallops. Let them cook in the heat for about 5 minutes. If serving the chowder right away, heat the cream to just below boiling in a separate saucepan and then add it to the chowder. If not serving the chowder immediately, there’s no need to heat the cream. Just add it straight away and mix it in. Add chives and gently stir in. Add salt, to taste. Ladle chowder into individual bowls add optional seasonings to taste. To thicken the chowder slightly, in a separate pot, make a roux. Melt 3 TBSPs butter over medium heat, add 3 TBSPs flour and whisk together for several minutes, until thickened and smooth. Drizzle this into the soup while the potatoes are cooking but do it well before the potatoes are cooked through. Stir constantly, to thicken slightly. This is a totally optional step!